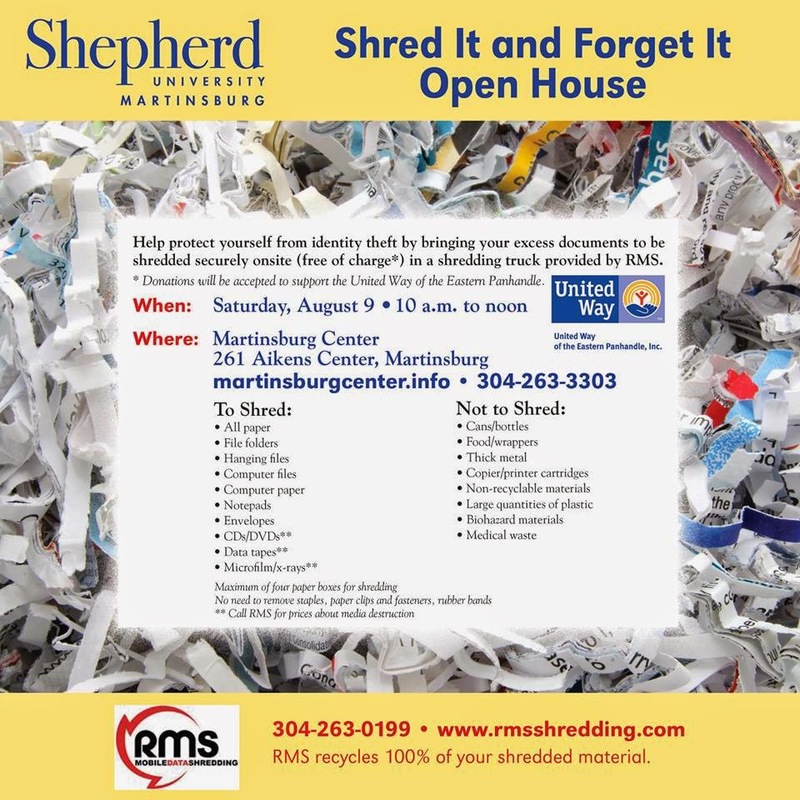 On Saturday, August 9, Shepherd University in Martinsburg will host a "Shred It and Forget It" Open House. This event will allow area residents to protect themselves from identity theft by safely and securely disposing of documents or electronic media with personal information. The following is a letter from Congressman John Delaney to Maryland Voters. It has been re-published here with his staff's permission. Many thanks to Congressman Delaney for working to help flood victims in Washington and Allegany counties. On June 12, 2014, heavy rain in Western Maryland produced severe flooding in Washington and Allegany County. Many residents saw their homes damaged or destroyed, businesses were flooded, and millions of dollars in damages were incurred. The damage was especially severe in Cresaptown, Bowling Green, and Clear Spring, where the flooding reached historic levels. Unfortunately, the State of Maryland has decided not to apply for federal disaster relief. Last week, I wrote to Governor O`Malley urging him to reconsider. After more than a month of displacement and loss, our flood victims deserve assistance. In the storm’s aftermath, I was proud to see our communities show incredible strength and compassion, as area churches, neighboring communities and the Red Cross worked together to shelter and feed those victims who lost their homes. Neighbors donated to neighbors, friends and families came together, and hundreds of people came forward and asked “how can I help?” As the rebuild continues, I’m going to fight for federal assistance for Allegany and Washington County. As your Member of Congress, I’ve urged Maryland’s state government to submit a formal request for federal assistance. State action is required as the first step for Federal Emergency Management Administration (FEMA) aid to be delivered. Altogether, affected communities sustained $3.6 million dollars in losses and over 200 buildings were damaged. When the Maryland Emergency Management Agency (MEMA) originally assessed whether flooded areas qualified for aid, the state agency estimated that flooding in Western Maryland did not meet federal standards. However, while the raw totals for damaged buildings fall short of federal standards for assistance, the Federal Emergency Management Administration (FEMA) can also consider the economic hardship of the communities affected, the number of flood victims without insurance, the concentration of the damages, and the depth of local resources. My letter to the state called attention to these factors, which I believe greatly increase our odds of securing assistance. Although the Administration has missed the date to submit a request, it may still be possible to receive an extension to apply for assistance. In my letter to Governor O’Malley, I requested that MEMA file an extension for federal aid and offered whatever support my office can provide. I also believe that the FEMA standards need to be revised, because clearly they are not accurate when it comes to assessing disasters in environments like Western Maryland. Local families and businesses have suffered devastating losses as a result of the recent flood, and as elected officials we must remain committed to helping affected areas make a full recovery. While I am concerned that Maryland’s state government never submitted a formal request for FEMA’s assistance, I was happy to see the Administration request relief through disaster loan programs administered by the Small Business Administration (SBA). On July 25, 2014, Governor O’Malley wrote a letter to the SBA asking that the agency issue a disaster declaration to make low-interest loans available to impacted residents and businesses. With so many families and business owners still struggling to rebuild, we have a responsibility to explore every avenue to recovery, and I was pleased to see the Administration do their part advocating for affected communities. As our district works to repair damaged areas and move displaced families back into their homes, I will continue to act as a voice for those flood victims who have not received the help they deserve. If you or a friend of family member was impacted by the June floods, please contact my office. 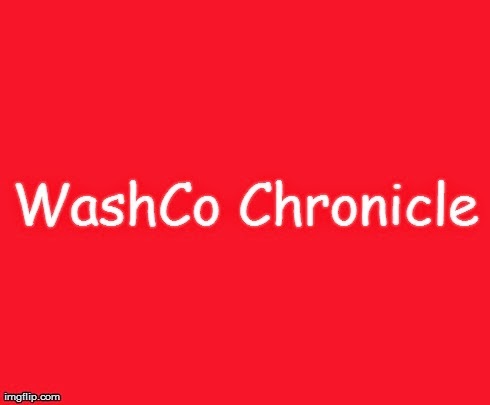 The following is a guest post from Cheri McBurnette, an independent contributor to the WashCo Chronicle. The term fibromyalgia derives from, fibro-, meaning "fibrous tissue", myo-,"muscle", and algos-, "pain". Fibromyalgia is a medical disorder characterized by chronic widespread body pain. Other characteristics of this horrible illness is fatigue, sleep disturbances, joint stiffness, numbness and tingling in the body, are some just to name a few. Fibromyalgia affects 2 out of 4 percent of the population, with a female radio of 9 to 1. Fibromyalgia is not a stand alone illness. Most sufferers are plagued by other illnesses as well, which are as equally as painful. Most fibromyalgia sufferers have a tendency to isolate do to lack of understanding and belief. To understand fibromyalgia, one must have had sufferered with this, otherwise it's inexplicable. It is called the invisible illness by sufferers because it's not seen by the naked eye. 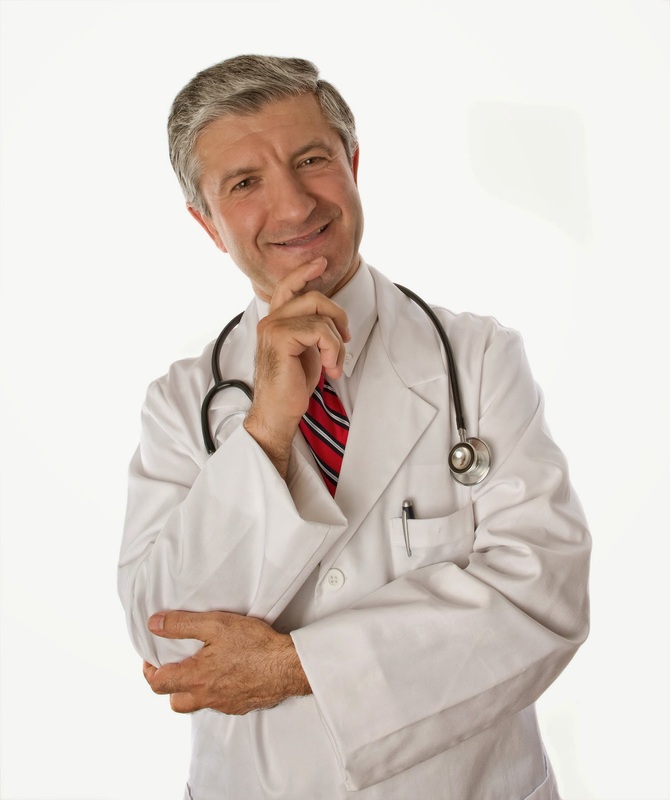 Extensive tests must be done in order to get a definitive diagnosis, otherwise it's difficult to diagnose. As a sufferer of fibromyalgia and other chronic illnesses, it's a struggle daily. Some of the ways that we get through each day is by prescribed pain medications. In addition, we take Epsom salt baths to relax the muscles and joints. Pain patches and herbal rubs gives a little relief. Managing fibromyalgia is not easy. Because hot water relaxes the muscles and joints, taking aquatic exercise classes in a heated pool always works well for sufferers. Any kind of resistance training always helps the cardiovascular. Tai chi, yoga and meditation can also give sufferers relief. Because it's not easily believed, some fibromyalgia patients suffer a great deal of stress. Speaking with a therapist can help ease some of the stress and worry associated with fibromyalgia. The following three medications have been approved by the FDA for fibromyalgia. Pregabalin, was approved in June of 2007, duloxetine, was approved in June of 2008 and milnacipran was in January 2009. If you know someone with a chronic illness, being understanding and sympathetic would greatly aid in the sufferers daily processes of survival. If you need support for fibromyalgia, you can go to People Living with Fibromyalgia Pain, on Facebook. Many thanks to Cheri for sharing her story and guidance. Miss Out on the #ShareACoke Event? Print Your Own Label! Unfortunately a few people at the #ShareACoke event in Boonsboro got left out, and they closed the machines while people were still waiting in line. However, instead of turning this into a negative event, let's turn it into a positive one. Were you still waiting in line? Did you miss the event completely? Don't worry, we've got you covered. While unfortunately you won't have the same font which is used by the Coke cans, you'll be able to customize it to whatever you want (you won't be limited to just your name), and you'll have three fonts to pick from! 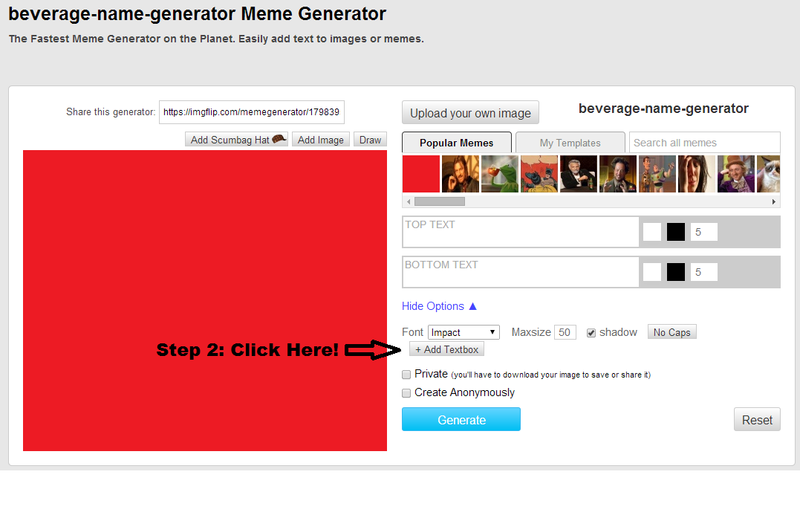 Over at the site imgflip.com, we've uploaded a plain red image for you to generate your own label. 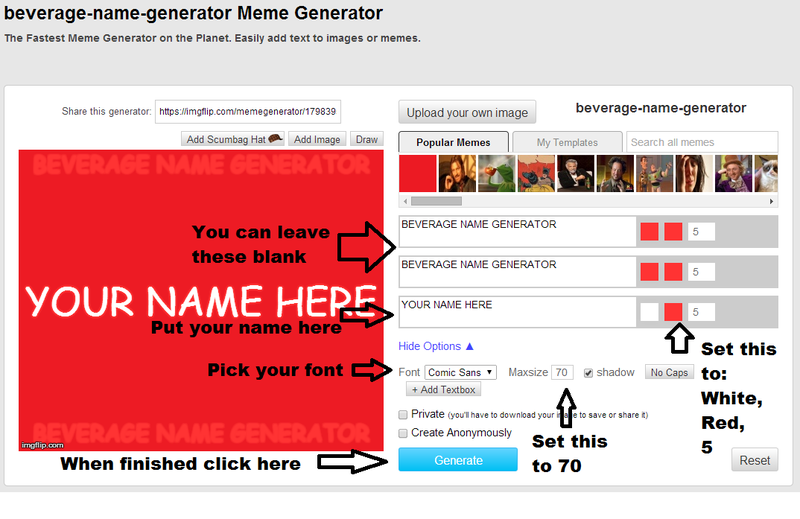 The steps to generate the label are easy. 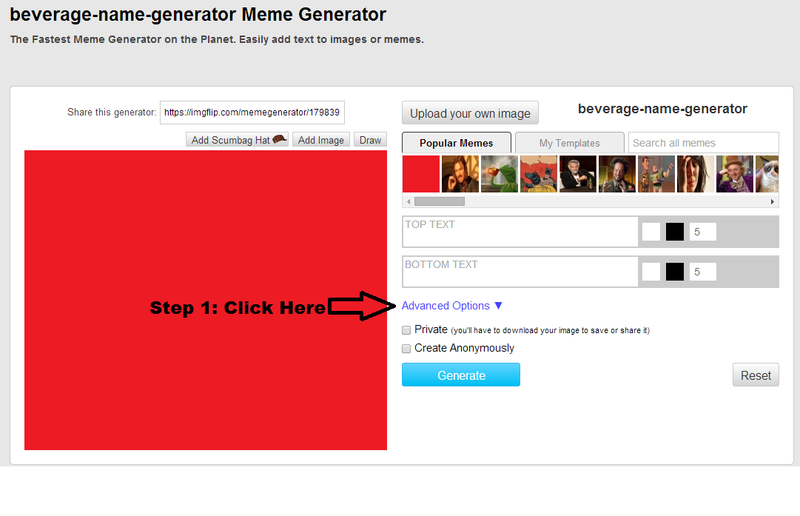 Just go to this link and follow the step by step picture guide below. 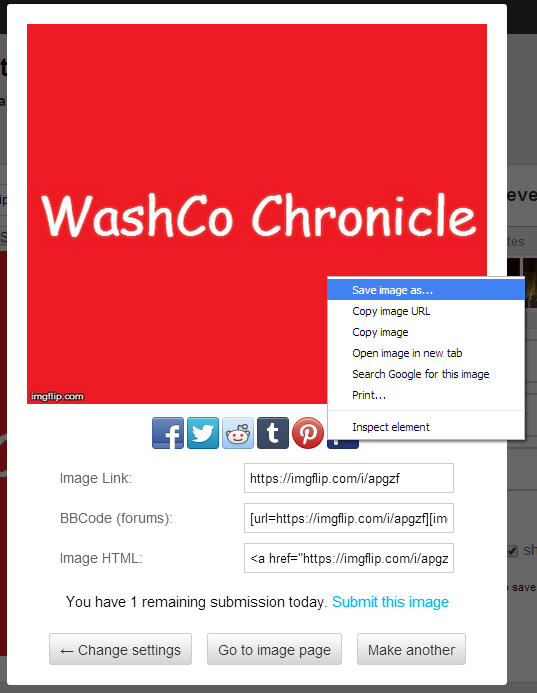 Once your label is generated, you just right click on it, and save it to your local computer. Then all you have to do is put the file on a CD or USB thumb drive, and take it to somewhere like Staples. Ask them to print the image(s) on sticker paper. They can print it whatever size you want, so if you've got a larger drink you'd like to put it on, such as a 2 liter, feel free! The following is a letter to the editor from Jamie Rowland, founder of "Healing Hagerstown"
In an effort to both gain information and share information with the fine people of the Washington County/Hagerstown community, I am seeking additional information and attention to the matter with regard to the lack of a regulated, affordable, and accessible, transportation infrastructure in our community. As many community members may or may not know, the Greyhound bus route has not had a formal bus stop in Hagerstown since early 2012. Many may not think they are personally or directly affected by this specific issue however, I would like to suggest that we consider the fact that when this bus stop was located on Rt. 65/ Sharpsburg Pike near McDonald’s, it was conveniently located across from the Premium Outlets and only a few miles north of the Roxbury corrections facilities also located on Rt. 65. This proximity, to arguably the most impactful large-scale cluster of revenue generating businesses in the area, can only have been favorable in the long run because it provided an additional point of access for non-residents to enter Washington County and spend their money here. We have a handful of Tesla vehicle recharging stations at the Premium outlets and while these recharging stations may be scarce to find nationally, they hardly seem to have the potential to be as fiscally impactful as busloads of people bringing cash carrying customers to our county retailers. There is so much dialogue in the local media about bringing new businesses to Hagerstown/Washington County. While I agree that recruiting big city employers to relocate to our area should be one of our many priorities, those currently in position of privilege and power aren’t doing enough to support the diverse number of businesses that are already in Hagerstown/Washington County. Another point to consider, as we all grapple with the prospect of continuing to watch our neighborhoods be plagued by a devastating wave of drug use, crime, and violence; when the Greyhound bus stop was located on Rt. 65, it was a convenient location for inmates released from any of the Roxbury corrections facilities to catch a bus and head back to their home towns or elsewhere thus giving them the opportunity to leave the Hagerstown/Washington County area. I ask my fellow community members, as I know many of us have expressed concern about the quantity of criminals making homes in our community, if we don't even have a Greyhound bus stop or Amtrak station in a central location in this county, how are these individuals supposed to have the slightest chance of leaving the community once they are released from incarceration? It goes without saying, that most of them don't leave because they are unable to do so. Instead, they become our new neighbors throughout the city and county in every neighborhood. Mr. Ralph M. Ruark No. 125977, Western Correctional Institution, shared in his letter to the editor published July 14, 2014 present factors he identifies as obstacles which parolees face, and that significantly contribute to recidivism. He also states that upon release, many parolees are homeless and have about $50. If this community does not want to continue to absorb this population, this community must be willing to support a public transportation infrastructure that provides reasonable access to a ticket out of the community . At this moment, a one-way ticket from Frederick to Baltimore is roughly $30. According to Herald Mail articles I’ve been able to locate online, it seems Hagerstown’s place on the Greyhound bus stop route started changing near the end of 2010. At which time the bus stop moved from the Sharpsburg Pike location to the Foxshire Plaza on Dual Highway as Hub City Shippers became a Greyhound ticket agent. In February 2012, the Washington County Zoning Board denied to give a special exception to allow the bus stop to continue operation at the Dual Highway location thus terminating all Greyhound operations in Hagerstown/Washington County. It is my understanding that at present date, in order for an individual residing in our community to access Greyhound’s transportation services, for an additional fee, they may take a shuttle from the downtown County Commuter transit center that will transport the passenger to Frederick, MD as it is the next closest Greyhound bus stop. It is ludicrous to me that a city whose nickname is based on the idea of being a central hub of transportation, can have such few and often poor quality community transportation services available to its residents. A fundamental necessity of a thriving community is a sound public and private transportation system. We should all expect and demand better bus routes and schedules, regulated and inspected taxi services, and Hagerstown/Washington County initiatives to explore an Amtrak stop in Hagerstown. Amtrak’s personal railway transportation stations are thriving in Martinsburg, WV and Brunswick, MD. Monday thru Friday, Maryland Transit Administration’s MARC train system uses the Amtrak system to provide public transportation for the hundreds of people living in rural communities like our own, who travel daily to their places of employment in the Washington D.C./Baltimore Metro areas. Surely, between the depleted quality of life one endures as a commuting employee sitting in hours of gridlock traffic just to get to and from work and the constantly rising costs of gasoline for vehicles, many Hagerstown/Washington County residents would welcome an alternative means of transportation to and from their jobs. We are all part of the same community and we are having similar conversations about what’s happening in our community. We need to start getting better at asking the difficult questions and making phone calls. Whatever it takes, we need to get so emotional about what’s happening in our community that it fuels our motivation to get behind a cause. Too many of us have waited too long for someone else to fix Hagerstown. We need to unite and take action to restore our community to a place of prosperity and desirable living. If each of us does our own share of responsibility and took ownership in the community. I think we'd all be pleasantly surprised by the positive changes we'd begin to see and maybe, just maybe, people would want to continue doing their part in little ways every day to keep moving in the direction of finding ourselves in a community we can thrive in. Hagerstown's buildings didn't crumble overnight and all our downtown and county businesses didn't close up shop at once. We are in this mess because over the past several decades, elected officials and people, including myself, got lazy and stopped taking ownership of the community. Please write your City Council member and County Commissioners if you are in support of getting Hagerstown/Washington County back on the map with regard to affordable interstate transportation. The various issues needed to be addressed to mend our community are multidimensional and will require efforts from all residents, business owners, and elected officials. This letter is intended to get people thinking about all of the different issues in the community that can stem from one seemingly small issue like public transportation. Clearly, affordable and accessible public transportation in any community will serve everyone for various purposes. In Hagerstown/Washington County's case, having a better transportation infrastructure will have significant positive impact the city/county's economy because more people will have the accessibility to come into our area to shop and visit and travel out of our area for work and leisure, all while residing locally. Consequently, there will be a ripple effect as we make our community more accessible; being a part of our community will become more desirable. In an effort to get as many people thinking about these issues, I am forwarding a copy of this letter to the Washington County Chronicle, the Hagerstown City Council, the Washington County Commissioners, and Congressman John Delaney. I believe each of us has much to offer our community so, I created the local Facebook group Healing Hagerstown. Healing Hagerstown is a grassroots movement intended to be representative of the community's journey from despair to prosperity and crime-ridden to charming. This journey, to seek and expect better for this town, can never end. Healing Hagerstown must start from within. By this I mean within the hearts and minds of the residents who live here and those in position of power and privilege that are willing and motivated to put words into actions. Any community member with an authentic desire to improve our community is welcome to join the group and our efforts to make positive changes in Hagerstown. HAGERSTOWN, MD - Local author Stacy Einfalt, who lives in Hagerstown with her husband and numerous family pets, looks to tackle the subject of bullying with her book "The Horse That Looked Different". Stacy encourages children to understand the problems with bullying through relating to animals. In the book, the Brown family instantly fell in love with and welcomed Starlit, a spotted Appaloosa horse, to their farm. The family's three chestnut Quarter horses weren't as easily willing to accept him because he looked different from them. Until one day when the four horses went on a wild adventure and got lost. They soon begin to realize Starlit's unique qualities aren't so bad after all. The book, which uses horses to address the issue of bullying, is dedicated to Stacy's horse Gotcha, who passed away two years ago while she was working on the story. "I use horses to bring across the message to children that they should not judge or bully someone for being different, but rather accept and appreciate them for who they are. Children need to begin learning from a very young age that it is important for them to respect and accept one another rather than choose to bully. 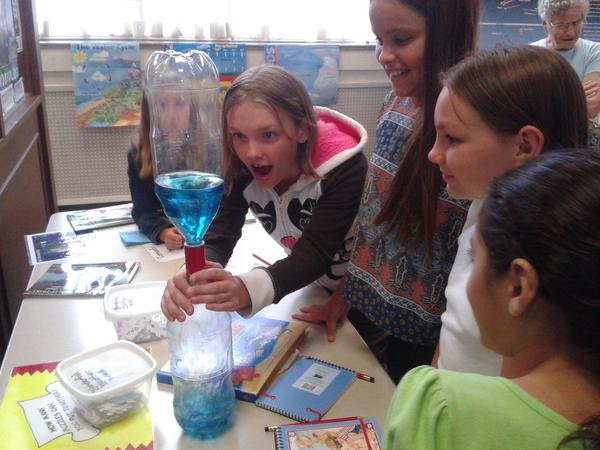 I feel my book could be a valuable tool to help teach children that lesson." says Stacy. Stacy has been visiting elementary schools, daycare centers, Head Start centers, and Boys and Girls Clubs reading her story to pre-k and kindergarten aged children. She recently participated as a guest reader with her book in the Community Literacy Night event at the Hagerstown Public Library. Nationally recognized literacy and anti-bullying organizations have given her book positive reviews and are also trying to help her spread the word about the story and its' message. Stacy has self published her book and it is available for sale in both paperback and kindle version on amazon.com (http://www.amazon.com/The-Horse-That-Looked-Different/dp/1496192087). It is also available for sale on createspace.com (https://www.createspace.com/4707541) and at Turn The Page Bookstore in Boonsboro, MD. "My brother was bullied in school and still at times gets picked on due to his lack of self esteem. Bullying has increasingly become worse in this day and age. It breaks my heart when I hear about a young person taking their own life or others due to them having been bullied. Children need to begin learning from a very young age that it is important for them to respect and accept one another rather than choose to bully." according to Stacy. The following is a guest post by Helen Allinson, a member of the Freestate Daylily Society. This Sunday July 13 from Noon till 4pm at the Cylburn Arboretum the Freestate Daylily Society will be holding their Bloom Show. This is a great opportunity to see lots a newer and more unique daylilies. There will also be fans available to purchase and information about joining this club and their other events. More information can be found at their website. The following is a guest post by Jamie Rowland, founder of the grassroots campaign "Healing Hagerstown". In April 2014, after the City Council positioned itself to vote for a temporary moratorium on the relocation and/or expansion of ambulatory clinics in the downtown vicinity, it became clear to me just how out of touch many elected city officials and city administrators are with the needs of the community. It also became glaringly obvious to me, just how out of touch I personally was with the state of the City and the political climate of the community. I took for granted my awareness of the scope of various issues facing vulnerable individuals in our community, shaped largely by my professional work. After watching countless hours of City Council meetings, and reading copious amounts of City documentation available for public consumption on the Hagerstown City website, it became even more clear that the current state of the City is the result of decades of missteps at both the leadership and residential levels. Regardless of my professional commitment to help people in this community, my personal commitment to work toward mending the seen and unseen damage in this community, is arguably much more important. Everyone seems to be waiting for someone else to fix what's broken and in many ways, for those of us who were born and raised in this community, it's as if the torch was never passed from our parents and grandparents to us. If the torch was passed, we have failed to take that torch and carry it toward a hopeful future. It was from this idea that my vision the group Healing Hagerstown was formed and as my involvement with various community Facebook pages has increased, so too has the outpouring of others' interests to do something to improve our community. This group is intended to be an easy to access forum for concerned and motivated citizens of Hagerstown and the surrounding areas in Washington County, MD. The vision of the group's creator is simple. Hagerstown is a broken city and it is not going to fix itself. This is evident by the variety of undesirable qualities which the community has acquired over multiple decades. Our city, once known for it's small town coziness has lost its soul. Healing Hagerstown is intended to be representative of the community's journey from despair to prosperity and crime-ridden to charming. This journey, to seek and expect better for this town, can never end. Healing Hagerstown must start from within. Meaning, from within the hearts and minds of the residents who live here and who are willing and motivated to put actions into words. Besides a responsibility to adhere to Facebook rules, the group rules are simple. If you would like to share information that can or could help heal this community in any way please do so. These posts may include everything from organizing neighborhood clean ups to posting fact-based information about substance use risks and the dangers of overdose. If it's relevant to improving our city and our citizens' quality of life, than post it for others to share. Disrespectful and/or negative posts and comments will not be tolerated and will be removed and acceptance into this group may also be revoked. Group rules are subject to change as the group evolves. You can join this grassroots movement and contribute your thoughts, ideas, and solutions at their Facebook group, "Healing Hagerstown". The group is a closed group representative of a grassroots movement to facilitate positive changes at all levels in the Hagerstown community. The following is a guest post from Brittany Wedd, Operations Manager of the Discovery Station. One of the greatest pleasures that I find in my work at Discovery Station is the responses that we receive from inquisitive children. In case you're not familiar with Discovery Station at Hagerstown, Inc., we are a private, non-profit organization (501) (c) (3) who's mission is to promote informal learning about science, technology, culture and local history. 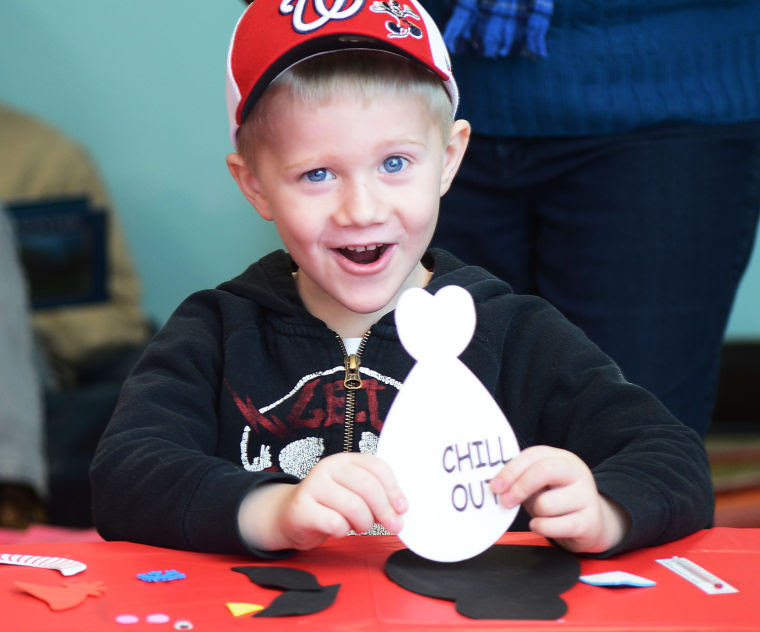 We are able to fullfill our mission through exhibits and programs that are both educational and entertaining. 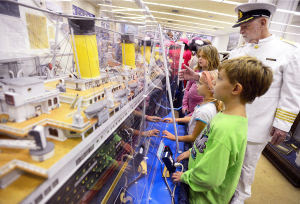 The museum is intergenerational and we receive just as many questions, compliments and pure unadulterated awe from parents and grandparents as from anyone. But to receive these from children is what truly fills me with a sense of purpose. When all is said and done, it will be and has forever been the next generation that will enlighten and further our society in the upcoming times. Discovery Station is encouraging kids to think outside the box with exhibits like "Space and Beyond". We encourage children to travel the world in our International Gallery and to learn about technological marvels with our Fairchild and Aviation Exhibit! As a non-profit organization, Discovery Station goes above and beyond to meet the needs of the community and to enhance the lives of everyone walking through the doors. But we need your help. If I may be honest here, it costs the museum over $250,000 to operate each year. One can only imagine how difficult this figure is to meet. We ask the community for their continued support through tax-deductible contributions to benefit the costs associated with operations, program development and exhibit expansions. It is through your support, that Discovery Station can continue reach out into the community and touch the hearts of our visitors to provide a legacy of lasting betterment. The following is a guest post from Jaclyn Beckner, who currently runs the "Backyard Chickens for Hagerstown" Facebook page. HAGERSTOWN, MD - As our food costs rise and the truth about what's really in our food becomes murkier with every passing day, many folks are looking toward backyard food production. This includes vegetable gardening, fruit trees, and even raising chickens. The local food movement has made waves across our nation, and cities/urban development areas have not been untouched by this. Why should we. as city-dwellers, be prohibited from providing the best food options we can for ourselves and our families? Why should we be required to pay higher taxes on our property but be permitted to do far less than we would be permitted elsewhere, outside the town limits? Backyard Chickens for Hagerstown, a community page on Facebook, is a group of like-minded residents who wish to overturn the city ordinance that states chickens are illegal within the city--even if we only initially succeed at being granted a trial run for one or two years. A proposal is being drafted, and when it's complete, we will present it to the city council. Aware that we will face opposition by many residents and council members alike, we are working on research to see how other cities (such as Baltimore, Maryland) handle their "chicken code" so that we can model ours after theirs, tailoring it to fit Hagerstown's needs and characteristics. We are not asking that cows or sheep be permitted--that's ridiculous. We don't even need roosters. All we want is to be able to raise a small flock (no more than 4) of hens for fresh eggs and meat for ourselves and our families. Regulations and requirements will be proposed, such as minimum lot size, coop and run sizes and condition, education requirements, applications for permits, inspections, etc. This is not meant to be a plea for legalizing a nuisance--it's a plea to legalize providing the freshest, safest protein we can for our loved ones. Would you like to join our cause? Visit www.facebook.com/chickens4hagerstown and like the page to stay updated and involved in the process. You may also email us at chickens4hagerstown@gmail.com. Sewage backup onto property near Funkhouser Park. HAGERSTOWN, MD - Local storms have left area residents flooded, and in some cases, caused sewage backups to overflow onto residents' property. 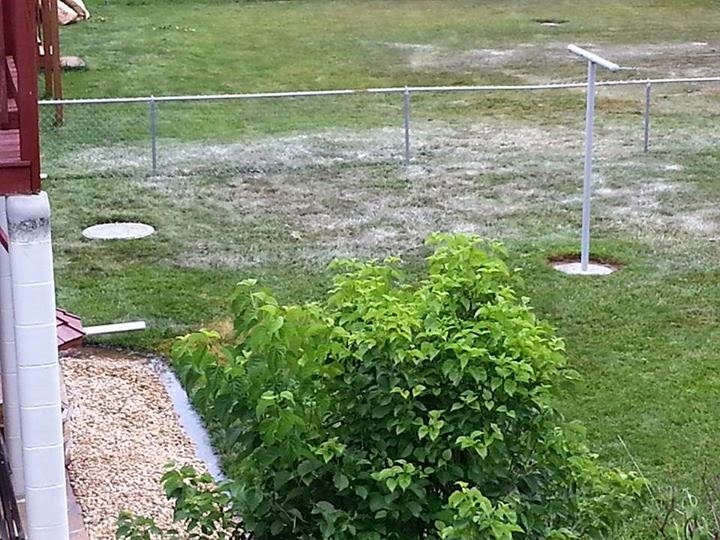 Residents of homes near Funkhouser Park, which is the home of the Hagerstown Pony League, complained of sewage in their yards after storms went through our area on Tuesday. "The same thing happened in 2006 or 2007. This is the effects of poor infrastructure and rapid growth in the North end. This did not happen with hurricane Agnes in 1972 but start after Lowes and Weis was built." stated one area resident, M Todd Roberts. Cleanup of sewage backup near Funkhouser Park. Officials informed Mr. Roberts that the sewer line in question is the main line that carries all sewage from the north end from State Line, to the treatment plant. Mr. Roberts further stated that "My opinion is that it's going to get worse especially with the retail / commercial zoning that the county commissioners approved at Marsh and Leitersburg Pikes." He also expressed concern that the Crampton's development in the north end will burden this particular sewer line much more. The sewage backup created a serious health hazard, which some residents were not immediately aware of, according to a post by Mr. Roberts on social media. 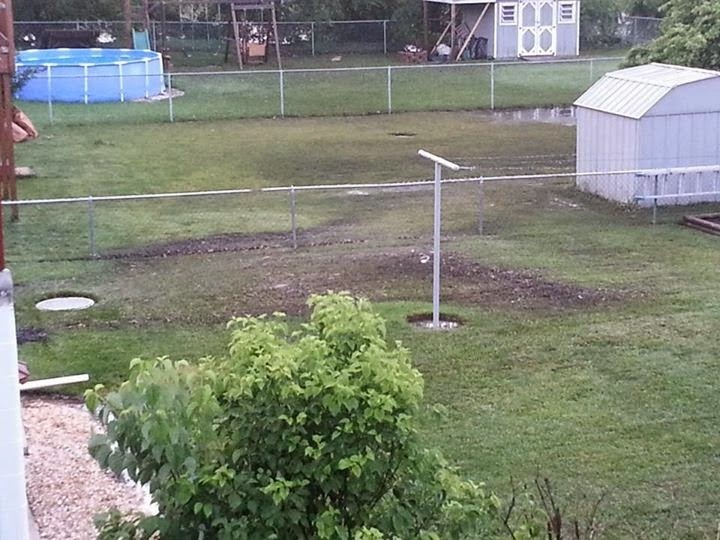 "Kids were playing in the water last night until my son told the adults watching that there [was sewage] in the water." Local area resident Susan Hammer responded with great concern, stating "...kids playing in the water?! They need tetanus shots immediately. ... go to the Washington County Health Dept. on Pennsylvania Ave just north of North High School. And please - don't just pass this to your neighbor - and don't assume that bacteria is not coming into your yard. Everybody you can get to call the Health Dept should. There is power in numbers of people." Susan also contacted several local officials about the situation, and was very discouraged by the response. "Given the responses so far, it may take demonstrations to change things unfortunately." Susan continued with "I don't even have any water problems - just feel really sorry for [those affected] and am enraged about the city and county's inability to act." The city did take some measures to cleanup the sewage overflow. As part of the sewage cleanup, the city put down lime to keep away maggots and flies. Other residents complained of unheard-of flooding issues as well. 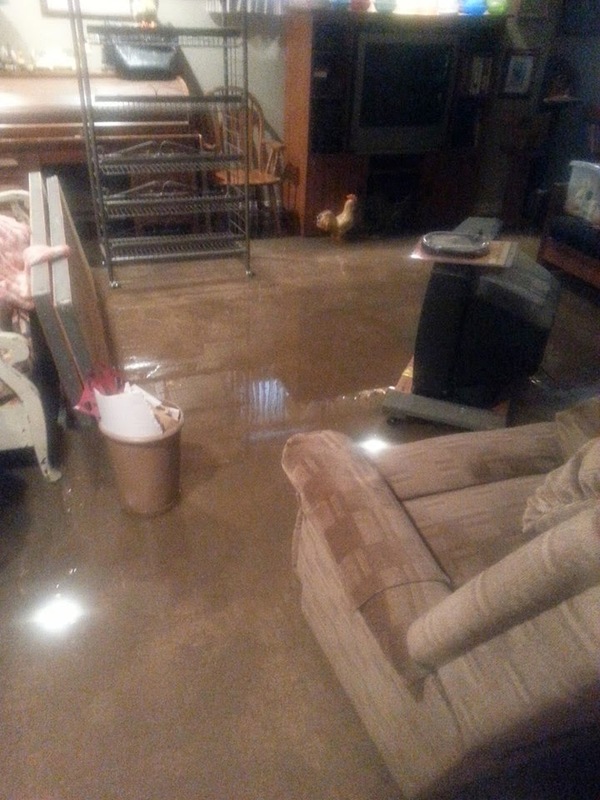 "We have a mess in our basement family room ... First water problem in the basement in 17 years." said resident Rocky Rine. Any Hagerstown residents affected by sewer backups should contact the City of Hagerstown at 301-739-8577 ext. 311. For those who may have been exposed to sewage, information about the Health Department's immunization program can be found at their website.